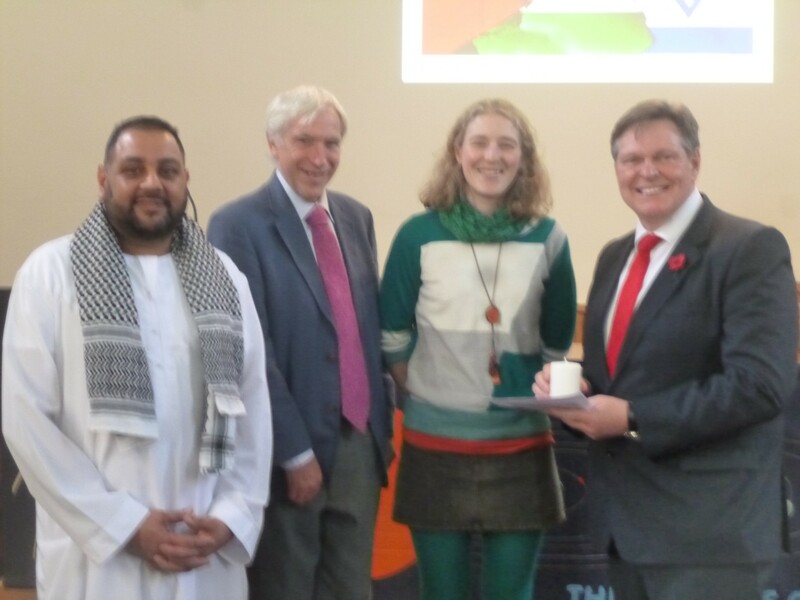 A message of peace for the peoples of Israel and Palestine was given in a special service at Stirling Methodist Church. The service, led by lay preacher David Rogerson, included Stirling MP Stephen Kerr, local councillors Ross Oxburgh and Alasdair Tollemache and Azam Haider from the Stirling Islamic Centre. Ruth Cape shared her personal experience of cycling from the UK to Palestine and Israel and, through her Cycle 48 initiative, visited the sites of seven former Palestinian towns and villages where people were working to build peace between the communities through genuine understanding of the wrongs of the past and present. Azam Haider shared stories from the earliest days of Islam, of respect and mutual support across Jewish, Christian and Muslim traditions. A new chaplaincy initiative called ‘The Listening Service’ has been launched in Edinburgh, with a team of 19 trained chaplains from the city’s faith communities beginning work on Tuesday 6 December at Edinburgh Sheriff Court. These new court’s chaplains will provide an independent, confidential support service to all court users and staff – of all faiths and none. Court staff and staff from other agencies at the court (e.g. Social Work, Victim Support) will be able to refer court users to the Listening Service. The service is free, private and confidential; a listening ear for all who request it, when it is most needed. The Project Leaders for the Listening Service are Rev Andrew Letby and Rev Hilda Warwick of the Methodist Church. Churches and Computer Hackers Join Forces to Fight the Cold! As autumn chill descends upon Edinburgh, two churches have joined forces with scientists, engineers and computer programmers in order to bring warmth to cold buildings across the city. HeatHack is a computing and electronics club formed by the City of Edinburgh Methodist Church and Christ Church Morningside (Scottish Episcopal Church). The club will set up temperature and humidity monitoring in buildings, time lapse photography (for gas meters and boilers), public displays and phone apps that help communities understand their buildings – plus some special engineering challenges like how to find out whether a pump is operating correctly and where the heat actually goes. Many community buildings in Edinburgh are old and expensive to heat – and costly to the environment – but this new ‘hacker-space’ is being formed to understand how to make the best use of the energy that is put in. As well as special events, HeatHack will meet regularly on Tuesday evenings starting in October. They welcome anyone with an interest in electronics, computer programming, or an interest in how these old buildings are maintained and kept at their best for their use by the community. HeatHack launched officially on Sunday 28 September at 12.30pm at the City of Edinburgh Methodist Church at 25 Nicolson Square, with an opportunity to see the technology in action. The City of Edinburgh Methodist Church has been officially informed that Sarah Boyack MSP has lodged a motion at the Scottish Parliament to commend the church on its recent partnership with Capital Credit Union, to facilitate the provision of credit union financial services to staff, members and the wider community in Edinburgh, Lothians and Borders. Ms Boyack had not been able to attend the church’s launch event for the partnership but wants to support the initiative. The motion has attracted strong cross-party support. MSPs have not been able to sent out their regular newsletters in the lead up to the Scottish referendum on independence, but Sarah plans to send out a newsletter immediately after the vote, which will include information about credit unions generally and about our initiative specifically. So far, the motion has been supported by: David Stewart, Anne McTaggart, Margaret McCulloch, Hanzala Malik, Annabelle Ewing, Jayne Baxter, Richard Lyle, Patricia Ferguson, Mark McDonald, Neil Findlay, Mike MacKenzie, Elaine Murray, Stuart McMillan, David Torrance, Jackie Baillie, Dave Thompson, Cara Hilton, Nigel Don. The City of Edinburgh Methodist Church has launched a new credit union partnership based at the Church. We’re delighted to be forming this partnership with Capital Credit Union, an experienced Edinburgh-based credit union, to offer financial services to our community. These services will help church staff and members, students and other local people build up savings, and access mortgages and low-cost loans. As a church we want to support the “not for profit, not for charity, but for service” ethos of the credit union movement and invite you to support us in this initiative. The City of Edinburgh Methodist Church is taking a stand against payday lenders by joining forces with a local credit union to bring fair and affordable savings, mortgages and loans to church members and the wider community. The church will promote the financial services of Capital Credit Union, an experienced Edinburgh-based credit union. This partnership is the first of its type in the city. As with all credit unions, members are required to save a specific amount each week, which is then pooled and can be loaned out again at low interest rates. Information sessions will be held at the church on a weekly basis and run by church staff and specially-trained church volunteers. The credit union partnership is officially launched at 6pm on 19 July at an event at the church’s Well Café at Nicolson Square in Edinburgh.